JOIN US IN A “Journey to Enlightenment”: Travel with us to the Wu dang Mountain in China August 1-19, 2009 With Master Yun Xiang Tseng (Master Chen) is about to take a group on the most powerful journey of their LIFE, a once in a life time mystical retreat to the World renowned Taoist temples on Wu Dang Mountain and to experience the wonder of China’s many historical and spiritual sites. You will learn alchemy, meditation, Tai Chi, Qi Gong, ancient tea education and herbal remedy seminars and much, much more. So hurry, Space is very limited . Call, TAO for LIFE. Earthsong. In Ancient Wu dang, China. Your Journey will start: Arriving at Wu Dang, you will be in awe with the mystical mountain; behind the veils of mist you will discover temples of jade and garnet. The ceremonial masters will invite the immortals to bless your prayers and good wishes. You will visit a cave and meditate in the presence of the spirits of Wu Dang. You will practice Tai Chi and Qi Gong each morning in the arms of the Purple Cloud Temple. Dining will be an adventure each day with three delicious, authentic and nutritious meals. Accommodations are all 5 star hotels or the best available in the area. Morning Tai Chi, breakfast, 1:30pm fly to Xiangfan, bus to Wu Dang, and lodging at Tian Lu hotel at mountain. Tai Chi, Morning Temple Ceremony, breakfast, visit Nan Nyan temple and Prince Cave and Master Li tomb site, a ceremony for Master Li by priests. Evening dinner in temple and meditation in the hotel. Morning Tai Chi, visit monkey valley and Yu Xu cave, cable car to Golden Peak Temple, overnight and see the moon, evening meditation. Morning see sunrise and do Tai Chi on the top of the mountain by Golden Temple, breakfast, visit Chen’s tea farm, tea picking and making tea, see Chen’s cave, local village lunch and dinner, meditation in hotel. Tai Chi, go to Wu Dang town, visit Wu Dang ancient gate, Golden Flower Temple, bus to Wuhan, then fly to ChengDu, see a show (changing face and opera) and evening foot massage, meditation. Morning Tai Chi, breakfast, fly to Jiu Zhai Gou, Visit beauty of mountain valley, lot of Kodak moments. Tibetan dinner, meditation, foot massage optional. Morning Tai Chi, visit most beautiful mountain valley, “heaven on earth” and shopping , evening meditation and qi gong. Morning fly to Er Mei Mountain, visit Buddhist temple and evening alchemy meditation. Meet Master Chen’s friends: temple abbot, musician, tea expert, and Dr. Li, a herbal king of China. Morning Tai Chi; Qi Gong with herbal king, tea expert take group to tea plantation to pick tea with monks, lunch in temple, in the afternoon, learning to play ancient music instrument GU QIN (www.leiyinguqin.com) meditation. Dr. Li will treat people optional ( fee not include). Morning Tai Chi and Qi Gong, And will be joining a Buddhist ceremony, you will be learning ancient tea ceremony art with master of tea art. Dr. Li will be giving a lecture in herbal healing; acupuncture and massage, treatment will commence on the site in the afternoon. A full Vegetarian meal will be in the temple. You will Continue music study after dinner or herbal healing art study, evening meditation class will be provided. Morning Tai Chi, then on to visit a sacred Buddhist Mountain and can watch monkeys play on the way to mountaintop. Full Vegetarian meal, then back to temple for tea ceremony with art and alchemy meditation. Herbal treatment is optional, drinking Herbal tea made by Dr Li. Morning Tai Chi and Qi Gong. Music study, ancient Buddhist ceremony, tea art, painting and treatment and a Lecture on immortality in the evening. Morning fly to Wu Yi Mountain, Transfer to hotel, In the afternoon going to river raft flow to see one of most beautiful mountain, a world heritage site. visit a traditional Wu Yi tea processing factory, tea plantation, and drink Wu Yi tea, evening meditation. Tea feast dinner. Morning Tai Chi, you will visit the mountain and a Taoist temple, then on to a ancient village, experience local cuisine, some street shopping and foot massage section, evening meditation and Tai Chi. Morning Tai Chi, then we will fly to Shanghai, and we will visit The Bond, The Yu garden and local shopping and sample Shanghai’s cuisine, boat ride on The Bond and see acrobatic show. After breakfast, transfer to PuDong international airport, fly back to USA. Cost: is approximately $3,250 before April 19, Moon. inclusive of all domestic airfare, all ground transportation, five star hotel accommodations (based on double occupancy), three meals per day, drinking water, Taoist ceremony, tea ceremony, entertainment, morning Tai Chi / Qi Gong instruction, tea and herbal healing remedies, group meditation, lectures, philosophy, history, question and answers and much more..
Not Included Round trip International Airfare to Shanghai Or the cost of the Visa. However, a full package is being put together as this page is being listed check back with us tomorrow for package prices including downloadable Visa applications visa fees must be sent by the applicant, no exceptions. About Master Chen, a child prodigy, at a tender age of six, he was taken from his home town to Wu Dang Mountain and taught the ancient Taoist Healing Arts by esteemed grandmasters. The youngest Enlightened Master, at the age of 16 he left the mountain to preserve the oral teaching by spreading the internal healing arts to the west. His training included austere measures both in cave practice and meditation and in the Temple. 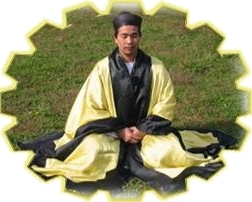 With the high degree of training he transmuted jing to chi, chi to shen at a very young age and now functions on a multidimensional intuitive level. His unfathomable insights through meditation and internal martial arts practice provide for profound teachings, which he translates and communicates with great patience and sense of humor. A truly unique gift to the Western world, Master Chen has transcended that which is ordinary and mundane. He is a facilitator of the Tao by guiding one to rediscover and reinstate the original intent of their lives. Visiting China with Master Chen is a rare and unique experience. Traveling with Master Chen, a Taoist priest, you will have the added benefit of visiting locations that are not accessible to ordinary tourists. His knowledge of history and the classics provides for in depth education and a once in a life time experience to connect to your Master Within. That Professor Vagarasoto's Terralab and AquaLab divisions of The White Buffalo Nation Inc in Nevada are installing the first tropospheric river diversion system in the world in China. a micro- bottling plant for the Wu Dang Taoist Grand Masters, Monks, Masters, Priests, for blessings and rejuvenation with enough water output for the Bagging of water for the many visitors yearly to this Sacred Mountain. Sacred water from the Holy Clouds of the Wu Dang Mountain Troposphere, will be truly an Ancient wonder of the world only from the Wu Dang Mountain in China.